Swiss RONDA startech Caliber 4120.B, 2-hand quartz analog alarm movement with big date, 60-second and alarm/reference time subdials. High Grade Sapphire Crystal with anti-reflective coating for a superior look, maximum resistance to scratching, and superb clarity. Numbered Limited Edition of 750 watches. "Alarm of the decade! No need for phone alarms when you have this bad boy! Awesome product that catches peoples attention and curiosity." - Carlos R. from the U.S. Meticulously mounted inside our iconic GX case beats a RONDA startech Caliber 4120.B. This unique movement brings a very cool analog alarm to your collection. 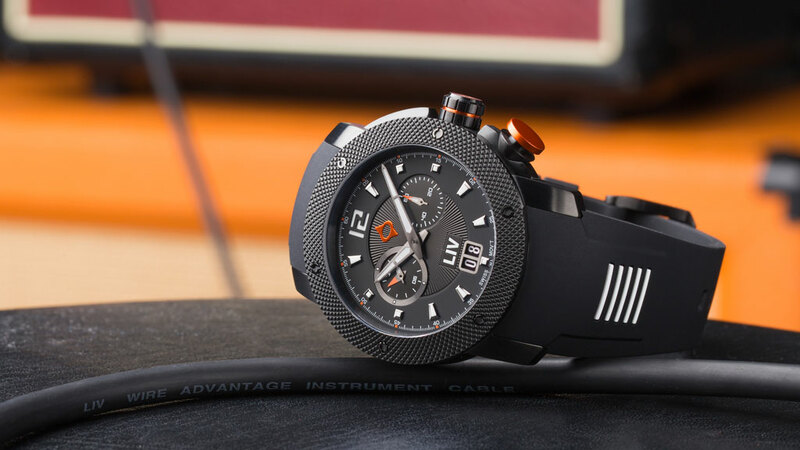 The 4120.B powers a 2-hand display of time with a constant running 60 second subdial at the 3 o’clock position. An easy-to-read big date feature occupies the 6 o’clock position. The alarm is the star of this show. You use the pusher at the 4 o’clock position to set the alarm and reference time which are displayed in a second subdial at the 9 o’clock position. A supple, double-injected silicone strap keeps your new LIV treasure secure. You can also choose from a case-matching 316L stainless steel bracelet with adjustable, push-button clasp. 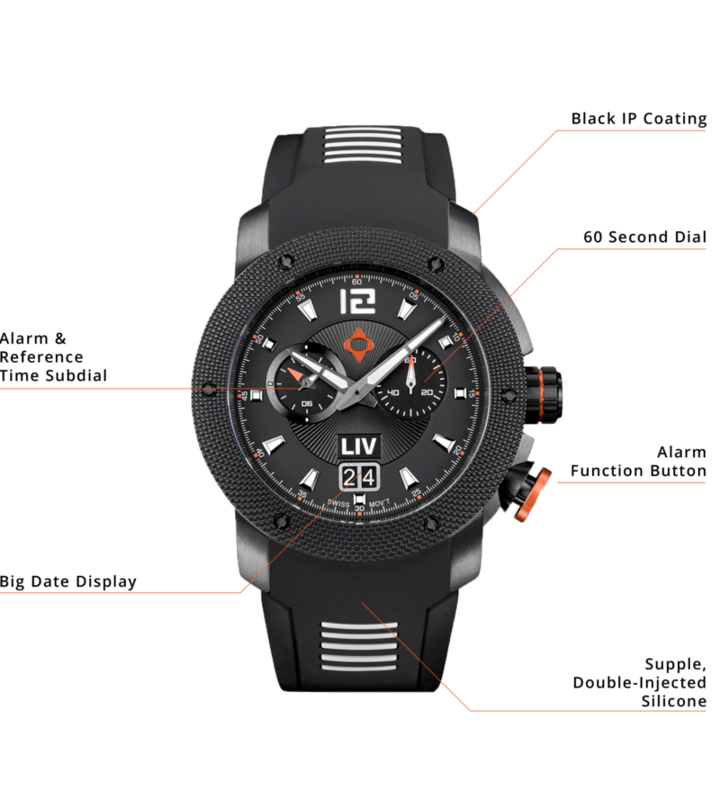 Built with LIV’s legendary attention to detail, the GX-Alarm will serve you through a lifetime of adventures. The alarm makes sure you don’t sleep through one. Only 750 of this watch will be crafted, ever. Grab yours and be one of 750 on the planet to proudly wear this jewel. No need for phone alarms when you have this bad boy! Awesome product that catches peoples attention and curiosity. Silicone band is comfy and watch sits easy on the wrist. Love my watch! It's obvious how well crafted it is, and the alarm is the most simple one to operate I've ever encountered. Needless to say, I will be a repeat customer, as I have family birthdays coming up later this year. Awesome watch! I have 2 watches from LIV, including the GX Alarm. I have a difficult time deciding which one to wear. They are both very comfortable and good looking that it is a fun problem to have. The alarm function is so practical during the day I have come to rely on it as a reminder. Highly recommend! Great Price, Phenomenal Quality, Love the look. Very happy with my new LIV Watch! BEST experience ever. Not only is the classic the PERFECT watch, I had the best customer service I've had in a very long time. Can't wait to get my boyfriend another!!!! Best watch I have ever owned. Sturdy, large face, classy, high quality. I will be back for another one. Simply amazing. These are outstanding quality watches and I couldn’t be any happier with my purchase. It simply looks and feels great on your wrist and the movement/craftsmanship is second to none. 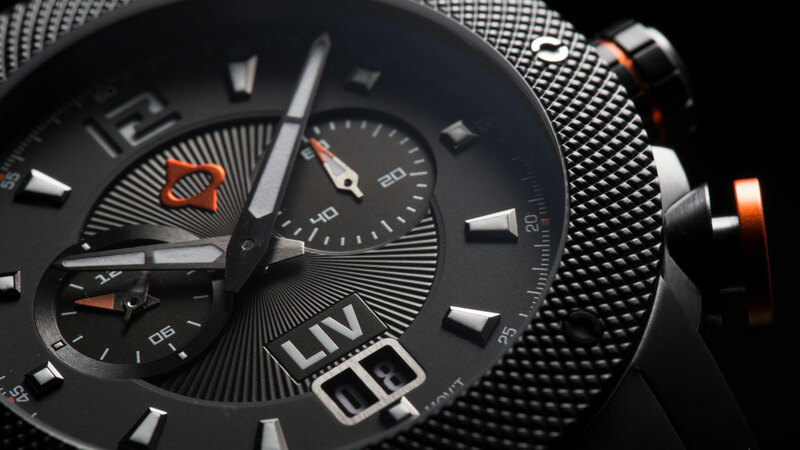 The price was too good to be true and I’m looking forward to getting another LIV timepiece. Thanks!